Ann Bloomquist Co-Founder/Executive Director changes roles – again! 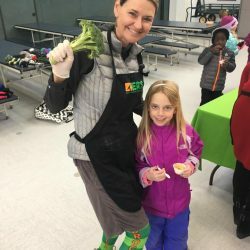 In 2013 when Ann Bloomquist approached Susan Odell about learning more about the Park City school food program, little did she know the hats she would wear over the next four years. Ann and Susan learned from then Child Nutrition Services (CNS) Director, Kathleen Britton, about the need for nutrition education for Park City students so they could make healthier choices and eat the improved school food Kathleen was beginning to offer. Lacking the resources to accomplish this, EATS – Eat Awesome Things at School – was born from a meeting attended by interested parents, teachers and community members. Susan became President of the newly-found non-profit and Ann took on the Vice President role. Under Kathleen’s direction and Susan’s chef experience, nutrition education programs quickly came online: taste tests – beet ratatouille and quinoa salad were the first two items – were made by CNS staff for kids to try. Cooking classes began at McPolin elementary in the after-school program. 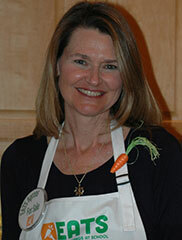 Anne Wallace, teacher at Ecker Hill Middle School, started planning for the first school garden the following Spring. Things were successfully rolling along with energetic volunteers filling all roles. Then things changed: within a month, both Kathleen and Susan informed Ann they were leaving for new opportunities and adventures. What would happen to EATS? Supported by her husband, Eric, and other volunteers, Ann stepped into the President role and pulled together a team of experts to guide her. For two years, this team directed programs and began fundraising efforts, resulting in catapulting growth. Ann says, “The organization grew organically because the community embraced the mission and supported what we were trying to do.” Soon it was obvious that more structure and personnel needed to be put in place if the organization was to continue to sustain its impact. Program Coordinators were hired, followed by a Program Manager. At that time, Ann assumed the Executive Director position – unpaid – for a one year obligation. The plan was to raise enough money in that year to hire an ED to replace Ann. And that is exactly what happened. Now, Ann will step aside to allow the new ED, Jenae Ridge, to lead EATS into the next phase of operation. Ann looks forward to spending more time with her family, traveling and cooking big meals. Likened to a child graduating from high school, Ann feels good about letting go but being there to guide when asked. “I’m not going away, I’m just opening up the opportunity for others to lead,” Ann says. EATS thanks Ann for her amazing dedication and energy to this welcome community endeavor. Courtney Caplan, Board President, notes, “The organization has been able to expand and strengthen our nutrition education programs while continuing to encourage the schools to cook more and more menu items from scratch. 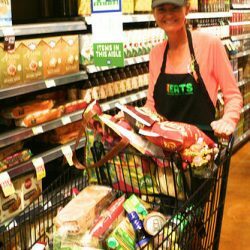 Ann has put systems in place to help us keep the momentum and move from strength to strength!” Thank you Ann for your time, vision, and personal investment into EATS.